As Leia sulks in the command center on Crait, we see the hooded figure of Luke enter, reminiscent of his entry into Jabba’s Palace in Return of the Jedi. It’s a touching family reunion between the two. 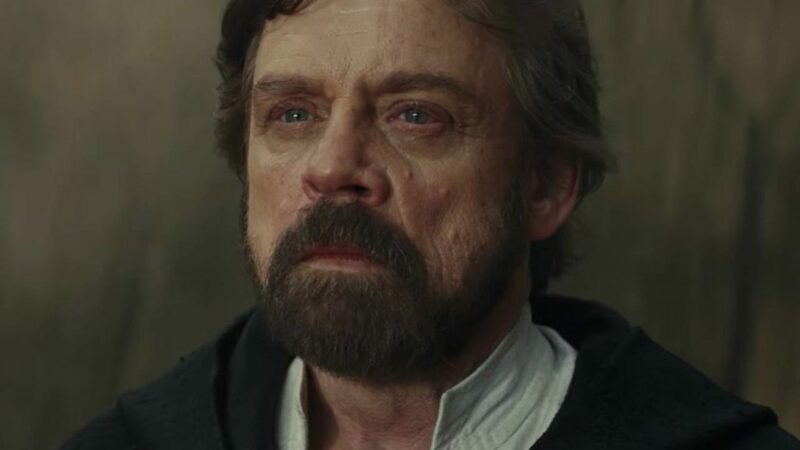 Luke explains that he has to face Ben and that he can’t save him. He ends the dialogue by saying that no one is ever really gone and hands her the gold dice from the Millennium Falcon. It was hard not to feel touched by this moment. Much like seeing Han and Chewie in action again and like seeing Han’s unfortunate death it is hard not to feel touched during these scenes with the original characters. Luke then heads out onto the battlefield to face the First Order army. In what seems like an anticlimactic move Kylo Ren orders every gun available to fire on him. I’ll admit, a part of me thought that was it. That was the tragic and cheap ending of Luke Skywalker. However, after a moment, the smoke clears and Luke is left standing there without so much as a scratch on him. It’s more like a scene from Dragon Ball Z than from Star Wars. I was happy though that Luke was still with us, at least for a brief time more. After a few minutes Poe says, “He’s doing this for a reason!” Then he figures out that they have to make an escape. Apparently no one ever tells Poe the plan. The plan is pretty flawed. They’ve already lost valuable time since Luke didn’t actually tell anyone the plan and they’re also backed into a corner with no perceivable way out. 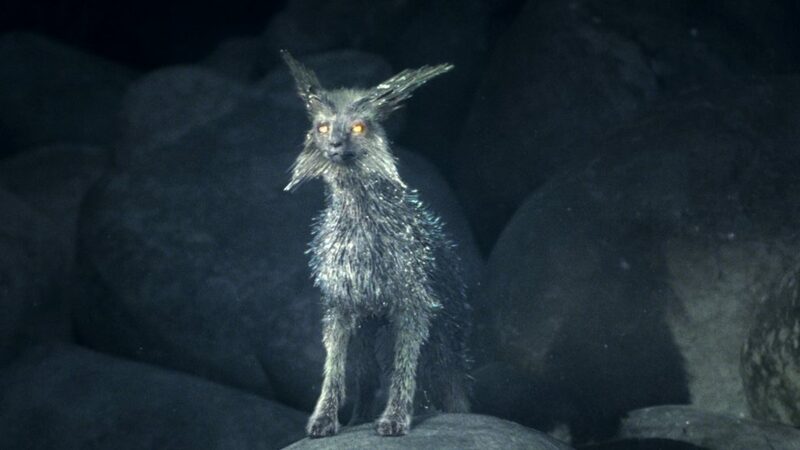 That is, until, they discover that the weird crystal foxes are somehow getting in and out of the base. They, unfortunately, reach a dead end with a pile of boulders blocking the path with gaps only large enough for the crystal foxes to squeeze through. “I failed you, Ben. I’m sorry,” Luke calls out across the salt flats. “I’m sure you are,” Kylo Red screams back. “The Resistance is dead, the war is over, and when I kill you, I would have killed the last Jedi!” This marks the first time the title of a Star Wars movie has been delivered as a line of dialogue in a good Star Wars movie. Luke then delivers a line he’s already used once with Rey: “Every word you just said is wrong.” Then the movie does a very non Star Wars thing and Luke’s words become a voice over as we see examples of what he is talking about. “The rebellion is reborn today, the war has just beginning, and I will not be the last Jedi.” It ends on Rey lifting all the boulders out of the way so the Resistance can escape. First we see Luke emerge from the smoke like Goku, now we see him dodge lightsaber slashes like Neo dodging bullets. Eventually he allows Kylo Ren to stab him through the heart and he doesn’t even flinch. It’s then that we realize Luke has been conning Kylo Ren this whole time. He’s not actually there at all. Kylo Ren has been duped and Luke is merely projecting himself, a technique Kylo Ren had brought up earlier in the movie. I’ll have to admit that I didn’t see this coming. I know I’m in the minority. Everyone else that saw this movie, apparently, noticed that Luke looked younger, that he was using his original blue lightsaber, that his feet were not leaving red streaks in the salt. In retrospect it was incredibly obvious but I was maybe the one theater goer that was blown away by this trick ending. Part of me could easily feel cheated out of the fact that there is not showdown between Luke and Kylo Ren. I could extend that to the fact that this is the only Star Wars movie aside from Rogue One that there is no point where two lightsabers touch each other. It is the only Star Wars movie with two lightsabers where no lightsabers touch each other. That aside, it is actually a pretty sneaky trick by Luke Skywalker. He keeps his promise that he is never going back and at the same time he achieves closure with Leia and helps the good guys escape. Luke vanishes after being stabbed by Kylo Ren. This is met with exactly the calmness we have come to expect from Mr. Ren. Next up . . . a bit more about Luke’s role in The Last Jedi and the conclusion of the film!